I make an appearance on CBC’s popular “Metro Morning” radio show! Gasp! I’m interviewed alongside Archie Comics creator, Dan Parent, about Harper! I’m on CityNews, Toronto’s premiere TV evening news show!!! I’m the Cover Model of “Special Living Magazine”! I read my second Fairy Ability Tales series book aloud! I was graciously invited as an on-air guest for “It’s Story Time: An International Children’s Reading Show”. I read “The Princess and the Ruby: An Autism Fairy Tale” live and aloud! 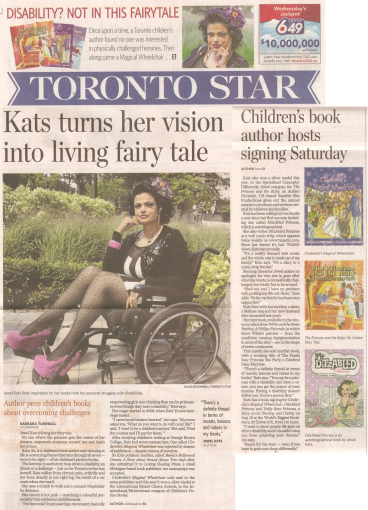 Etobicoke, Ontario’s Largest Newspaper Interviews Me! “Etobicoke Guardian’s” editor, Tamara Shephard, does an up close and personal interview about me!